It’s a given—designing your emails to create the best user experience leads to more click-throughs and conversions. And, unless you consistently use responsive design, knowing which device your customers prefer to use when opening and engaging with emails is key to creating that experience. We’ve analyzed the data from 1.9 billion email opens in Q1 of 2016, as well as conversions from those emails. 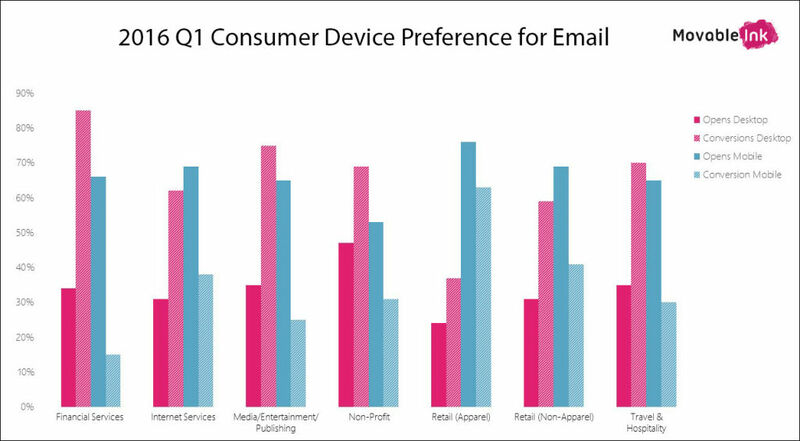 Below is a breakdown by industry on desktop vs. mobile preferences. In Q1, apparel shoppers continued to be more likely to open and convert on mobile devices than in any other industry. It’s the only group that consistently prefers mobile to make online purchases. Mobile open rates topped the list at 76%, and mobile conversions were 63%. Most industries see more conversions on desktop versus mobile, but only 15% of financial service customers—the lowest rate of all industries—used mobil devices to buy products and services in Q1. Travel and hospitality emails had the second highest desktop conversion rate at 70%. Although all of the industries we analyzed saw more emails opened on mobile devices, many non-profit recipients still open on desktop—47% on desktop versus 53% on mobile devices. This entry was posted in Email Marketing on April 27, 2016 by Amy Mullen.